Sensorex, located in Garden Grove, California was founded in 1972 to manufacture quality sensors for water applications. They are a market leader and manufacture more than 2,000 different sensor packages sold directly to OEMs or through their worldwide distributor network. Sensorex has achieved worldwide sales of approximately $10 million with 123 employees. Sensorex has been faced with the challenge to continue to meet their customers’ demands for both a high quality product and lower price. Customers have also been looking for improved delivery and a reduction in lead time. The Sensorex management team determined that identifying and overcoming their internal constraints to increase productivity was a priority. A three phase Lean transformation project was kicked off on September 4, 2008 for the Lab 1 team. Phase 1 included an introduction to basic Lean principles. The team was lead through the Lean transformation process using Lean simulations to look at a current production method to identify potential improvement ideas to increase productivity. The team was also trained on cellular flow layout, Point of Use Storage (POUS), Kanban signals, batch size reduction, single piece flow and balanced work. Phase 2 was an introduction to the Value Stream Mapping process and objectives. On the shop floor, the team mapped the flow of both product and information. The draft versions were validated for accuracy and reviewed by supervisors, managers and key process owners for clarity, accuracy and content. Phase 3 was a “brainstorming” process to develop a list of possible improvements from the value stream mapping. The team analyzed productivity issues and constraints and developed a prioritized list of 19 potential improvement actions. A formal presentation was made to management and management assigned resources to the high priority recommendations. The project was completed November 24, 2008. As a result, Lab 1 is now setup as a “self-contained” work cell. Employees have ownership of the process and an increased level of “self-direction”. Work instructions have been simplified and made very visual. Travel distance for both work in process and product has been reduced by over 75%. Visual inventory indicators and Kanbans are in use to improve communication, reduce part shortage and improve productivity. Product inspection has been integrated into the cell. 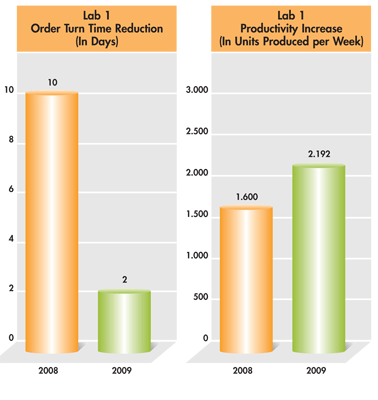 The project resulted in a reduction in order turn time from 10 days to 2 days, an 80% improvement. Their customer Lead time has been reduced from 3 weeks to 1 week. Productivity in Lab 1 has been improved by 37.5% with annualized savings of $127,500. "I would recommend CMTC to any small manufacturing business. CMTC consultants were able to give us the framework and tools to implement dramatic positive changes quickly with immediate payback."